HP’s TouchPad fire sale could drive low-volume tablet makers out of the market, further padding Apple’s market share and reducing consumer choice in the long term. Here's the scenario that's developing. Suppose HP sells half a million TouchPads at deeply discounted prices -- $99 for the 16GB WiFi model, which originally sold for $399, and $149 for the 32GB WiFi version, which originally sold for $499. That isn’t a stretch, since it sold an estimated 350,000 of the slates during the first wave of bargain basement pricing with a second wave to come. Those sales will hurt all tablet makers, but the impact will be less severe for a tablet maker selling 9 million units a quarter, like Apple, than those selling 500,000 a quarter, like Samsung or Research In Motion. Everyone likes a bargain, so it's easy to understand why a tablet with critically acclaimed technology selling for $99 is flying off the shelves like there's no tomorrow. Actually, there is no tomorrow for the TouchPad, because HP won't be making any more of them. While consumers may benefit from those "everything must go" prices in the short run, in the long run, they may be contributing to hurting competition in the market and furthering Apple's dominance of the market. Some of those ill effects on low-volume tablet makers might have been abated if national electronics behemoth Best Buy had stuck to its decision to return its TouchPad inventory to HP. But once the big box retailer got a sniff of the sales velocity of the tablets at the HP website, it had a change of heart. "Due to HP’s decision to discontinue its TouchPad product, Best Buy will now provide clearance pricing for all HP TouchPad models regardless of previously advertised prices or promotions," the company said in one of its online community forums. Best Buy added that customers who bought a TouchPad after June 19 can receive a refund for the difference between the purchased price and the clearance price. Or if they're skittish about owning a discontinued model, they can return the unit to where they bought it for a full refund, it added. Ironically, HP has decided to discontinue the TouchPad just when signs were appearing that it may be gaining some traction in the market. A study released last week by Robert W. Baird & Co. showed that the iPad's popularity remains dominant, but in second place, albeit a distant second place, was the TouchPad. Of the 1100 people polled for the survey, 94.5 percent said they were interested in purchasing an iPad over any other tablet device. If they couldn't get an iPad, though, 10.3 percent of the respondents said they'd be content with a TouchPad. "Although the figures differ depending on who you talk to, it is clear the complete dominance enjoyed by the iPad a year ago is beginning to slip," wrote John Norris at RCR wireless News. "HP’s TouchPad has proved something of a dark horse." The demise of the TouchPad raises an interesting question about tablet pricing and whether it could be a key in breaking Apple's grip on the market. 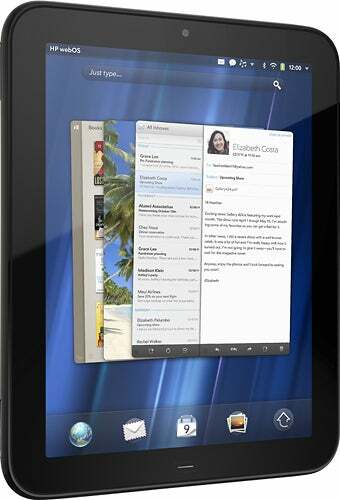 "[T]hink about the appeal of a quality $100 tablet," wrote Joe Wilcox in Betanews. "People are clamoring to buy a product with no future. HP isn’t going to make any more. There won’t be new cases or peripherals. Meanwhile WebOS’ future is uncertain. Still people are fighting to pay."